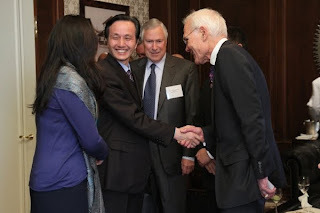 Seattle Opera recently received several distinguished visitors from China's National Centre for the Performing Arts, host of last summer's World Theatre Forum. Last June, three members of Seattle Opera's staff traveled to Beijing for the NCPA's third annual forum. Four staff members from the NCPA visited Seattle last weekend: Mr. Deng Yijiang, Vice President; Ms. Zhu Jing, Director Department of Brand Promotion; Ms. Wei Lanfen, Deputy Director Programming Department; and Mr. Wang Dayu, Director Department of Education and Outreach. The group from the NCPA toured McCaw Hall and met and dined with several members of Seattle Opera's staff and board. Ms. Wei Lanfen, who is fluent in English, acted as translator.